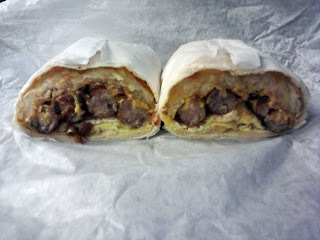 A breakfast burrito, if done well, is a beautiful thing. I love breakfast food anyway, and if you can pack it into a portable form where I get a little of everything in each bite, I'm a happy guy. I work in a somewhat large office, and there seems to be a little debate over who does the best breakfast burritos in the area, Los Beto's or Bad Boy Burgers. To be honest, I like them both quite a bit, but for different reasons. 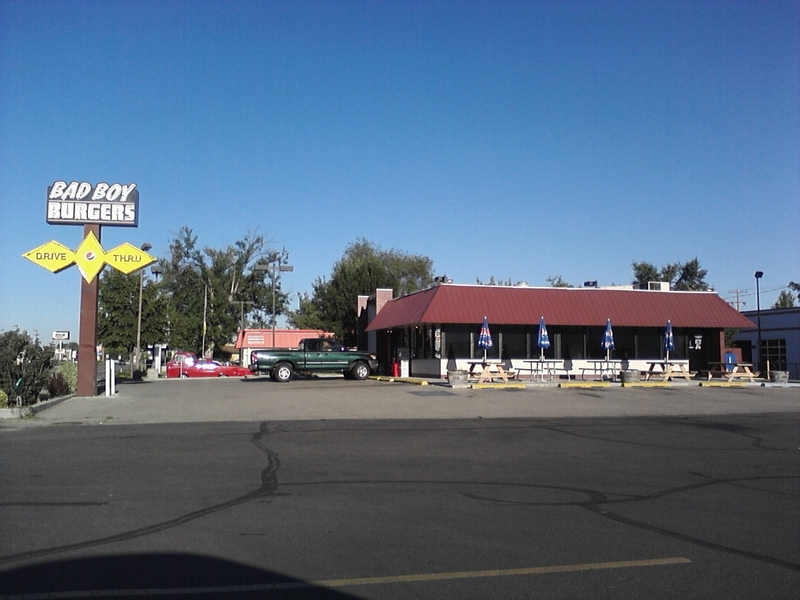 Bad Boy Burgers has two locations in Boise, but I've only ever been to the one on Fairview, just East of Cole Road. I've been a fan of the breakfast burritos at Los Beto's for a while, but eventually all the good things I was hearing from co-workers and at Steelheads games (they were a sponsor for a while) about Bad Boy's made me curious, and I decided to try one out. It didn't go very well because I was wearing a black shirt, and the tortilla was dusted with flour or something which made a total mess of my clothing. I was so irritated that I didn't even remember what the thing tasted like. It's been a couple of years since then, and I've enjoyed many lunches at Bad Boy, so the other day I decided to give the breakfast burrito another chance. Even though it's my instinct to order them with bacon (hell, I order everything with bacon, if it's available), I decided to be adventurous and try a sausage one since that's the type I dislike the most at Los Beto's. Where the Los Beto's version has ground chorizo and always makes me wish they would just slice and fry it with the other ingredients, I figured this one would be more conventional and just use ground breakfast sausage or maybe sliced kielbasa. I couldn't have been more wrong. My camera phone isn't the best, so in case you can't make that out what they've done is to lay four breakfast sausage links next to each other, which are then split in half when they cut the burrito in half. Yes, they cut it in half like a sandwich. But you know what? It works. The whole thing works. Personally, I much prefer sausage intact or sliced rather than just ground up and mixed into things, and having the burrito in two easy-to-manage pieces is very convenient. Rather than home fry-style potatoes, Bad Boy uses the shredded hash browns and actually crisps them up a bit before adding them, which gives some nice texture. The egg is very nice too, cooked thin and then folded over on itself again and again in layers, and they use just enough cheese so that you can taste it without having it be the only thing you can taste. The one place I almost have to fault Bad Boy is that they charge you extra for some of the sauces and condiments, in this case twenty-five cents for salsa, but at least it's a decent amount and they give you the option of putting it in the burrito or having it on the side. The salsa is good too, more like a pico de gallo, and I ordered it on the side so it the tomatoes and onion would retain their texture. In the name of writing a more "professional" review, meaning one where you try more than one menu item and preferably go back to the restaurant on different days at different times, I returned a couple of days later for lunch. Well really, I just wanted to have an old favorite, the grilled sourdough bacon cheeseburger. In all actuality, this reminds me more of a patty melt than a cheeseburger, due to the fact that it's served on sandwich-style sourdough bread instead of a bun and that there is basically no plant matter involved. It's just bread, meat, more meat, cheese, more cheese, mayo, and for some reason tomato (don't get me wrong, I'm glad it's there). Like the breakfast burrito, they cut this burger in half, which is nice since it's not a particularly small sandwich and given the two slices of Swiss cheese and the frankly overly-generous amount of mayo could get messy pretty fast. Generally I would like a little less mayo and a little more vegetation, but when I'm in the right mood this thing just hits the spot. Bad Boy also scores extra points with me for still having tarter tots available, though they do charge extra for fry sauce. My advice? It's worth the extra quarter, and they give you a fair amount of it. My only complaint is that they've recently switched from Coke to Pepsi products, meaning I can no longer get the big Styrofoam cup of vanilla Coke I've always enjoyed with my order, but I guess as long as the food stays the same I can't be too unhappy. And don't think it's all burritos and burgers! Though I've never tried most of them, there are many different options at Bad boy including fish and chips, finger steaks, salads, pastrami sandwiches, BLTs, club sandwiches and gyros. They even have something they call the Greek Swiss burger which consists of beef, lamb, lettuce, tomato and ranch dressing. I think one of those might have to find its way onto my plate soon. Just to satisfy my academic curiosity, you know?